Shellac Stack No. 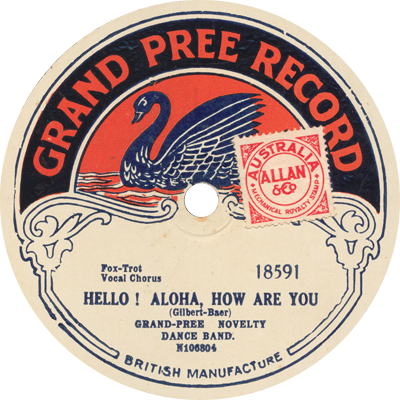 87 greets you with “Hello!” and “Aloha”! We hear some fine jazz from Lu Watters, Jack Jenney, Lester Young, and Louis Armstrong; solid dance records by Jacques Renard, Jack Harris, and the Great White Way Orchestra; and we even nod to the classics with pianist Hans Barth and the orchestra of George Cathie.